Aim: The aim of this systematic review was to identify studies that examined maxillary lateral incisor agenesis treatment, by either orthodontic space closure by canine mesial repositioning and reshaping, or by a prosthodontic intervention, in order to compare the biological, functional and aesthetic outcomes of these two approaches. Materials and methods: An electronic MEDLINE search was conducted by two independent reviewers in order to isolate English language articles, published in scientific journals between January 1975 and March 2015, reporting on treatment of agenesis of maxillary lateral incisors, accomplished either by canine orthodontic repositioning or prosthodontic intervention. The search terms were categorised into the four groups comprising the PICO (problem, intervention, comparison and outcome) question. Supplementary manual searches of published reviews and other full-text articles were also performed. Results: The initial database search produced 8,453 titles. After careful examination and discussion, 12 articles were selected for inclusion, where 5 of them compared the two therapeutic options directly. No randomised controlled trials were identified. Conclusions: Definitive conclusions cannot be drawn, since randomised controlled trials and more prospective and retrospective studies directly comparing the two therapeutic options are required. According to this systematic review, both therapeutic options are effective. However, it seems that the orthodontic space closure, whenever this is possible, is advantageous over the prosthodontic rehabilitation. Aim: This study systematically evaluates existing evidence-based literature covering the topic of patient information about different treatment alternatives for missing single teeth, in order to summarise current evidence. Material and methods: Three scientific databases - Pubmed, OvidSP and Scopus - were searched for publications up to July 2015, relating to patient information on treatment options for missing single teeth. References of publications and the google scholar database were screened additionally leading to a total of 183 journal articles written in English. Following the selection criteria, 33 articles were included. Twenty-nine questionnaire- based publications were compared by descriptive analysis of six key parameters - awareness of treatment options, source of information, knowledge, attitude to treatment, preference of treatment option and reason for refusal. Results: Included studies consisted of data from 23,702 responding participants and which were performed in 16 countries. Mean values and standard deviations revealed variations between and within countries. The level of awareness and attitude to treatment in most countries is acceptable. Insufficient knowledge as well as a high demand for knowledge was found. Clinicians are the most important source of information followed by media, family and friends. Dental Implants and FPDs were preferred and high costs would be the major reason for refusal. Conclusion: Clinicians play an important role in improving awareness and knowledge of patients about treatment alternatives. Non-uniform study designs could lead to variations in results. This systematic review can be considered in further studies, in order to standardise methods using key parameters and a representative study population. Single implants and their crowns have high survival rates that exceed the survival rates for fixed partial dentures on teeth and most but not all publications have determined single implants are more cost-effective than 3-unit fixed partial dentures. Both initial root canal treatment and retreatment are more cost-effective than tooth extraction and rehabilitation with a single implant and crown. Horner, Keith / Shelley, Andrew M.
Aims: Missing single teeth can be treated in several ways and preoperative radiological evaluation varies accordingly. The main area of controversy relates to the need for cross-sectional imaging in the context of implant treatment. In this context, the aim of the systematic component of this review was to determine whether the use of additional cross-sectional imaging has any impact on diagnostic thinking, treatment planning or outcome, compared with conventional imaging alone. An additional aim was to present information relating to diagnostic efficacy, dose of radiation, economic aspects of imaging and selection criteria. Materials and methods: PubMed/MEDLINE, OVID/Embase and the Cochrane central register of controlled trials were searched up to and including June 2015. Studies were eligible for inclusion if they compared the impact of conventional and cross-sectional imaging when placing implants. Quality assessment of studies was performed. Synthesis was qualitative. Results: Twelve studies were included, all of which had a 'before-after' design. Only three of these were limited to single implant treatments with none limited to immediate implants. There were methodological problems with most of the studies and results were sometimes contradictory regarding the impact of cross-sectional imaging. Conclusions: It is tentatively suggested that cross-sectional imaging may not be required in straightforward, unchallenging, cases of missing single teeth being considered for implant treatment. Beyond this, no strong evidence exists to inform the choice of imaging. Existing guidelines on preoperative imaging for missing single teeth are not unanimous in their recommendations, either for implant or non-implant treatments. Aim: The purpose of this literature review is to systematically evaluate the impact of immediate implant placement and restoration (IIPR) on hard and soft tissues and to identify clinical parameters which influence the outcome. Materials and methods: An electronic search of the PubMed database was performed from January 2000 to September 2015. A further hand search was conducted in selected journals and only abstracts published in English were considered for review. Human clinical trials with at least 10 participants and which reported hard and soft tissue outcomes were assessed. Randomised controlled trials (RCT), prospective, prospective comparative and retrospective studies were considered. The effects of the following clinical parameters on hard and soft tissue outcomes were analysed: type of implant, primary stability, gingival biotype, flapless surgery, tooth extraction, spatial arrangement of the implant, socket grafting, the gap between implant surface and alveolar wall and the loading protocol. Results: 17 studies (four RCT, six prospective, two comparative prospective, three controlled cohort and two retrospective studies) were included with 626 censored IIPR in 609 patients. A total of 411(65.56 %) implants were placed flapless vs 215 implants after raising a mucoperiosteal flap. Five studies defined raising a mucoperiostal flap as a mandatory part of the surgical protocol. The mean of the remaining gap in between the implant surface and the alveolar wall, the so-called "jump space", was reported for 170 implants ranging from 1.38 mm to 2.25 mm. Two hundred and one implant sites were not grafted, 405 were grafted, mostly with bone substitutes; for 20 no information was available. For 419 implants, a minimum insertion torque of ≥ 32 Ncm or an ISQ value of ≥ 60 was reached; for 53 implants an insertion torque of 25 Ncm was accepted. The implants were mostly placed palatinally of the jaw bone. The vertical position of the platform was reported either to be 0.5 to 1.0 mm below the vestibular bone crest or 3 to 4 mm apical to the adjacent cementoenamel junction of the neighbouring tooth. Post-insertion healing with a non-functional occlusion occurred for 97.8% of the implants. The final single crowns were inserted 3 to 6 months after implant placement. The IIPR resulted in a high success (97.96 %) and survival rate (98.25%) after a mean followup period of 31.2 months. The soft-tissue biotype was evaluated in 379 (60.5%) sites as thick. The mean crestal bone and the mean interproximal mucosa level changes were less than 1 mm compared to the baseline. The midfacial periimplant mucosal level change was less than 0.95 mm. This level was reached for both thin and thick soft-tissue biotypes, without a significant difference. Only in one study did the thin biotypes show a significantly higher recession. Conclusion: The systematic review revealed promising results for immediately placed and immediately restored implants (IIPR) in the anterior maxilla. The possible options of flapless surgery and absence of grafting of the socket allows a minimal surgical intervention. However, a strict patient selection seemed mandatory for all included clinical trials. Aim: To assess the outcome of immediate or early placement of implants after tooth extraction supporting a single-tooth restoration with focus on the marginal bone level and its stability over time. Material and methods: An electronic literature search without time restrictions was conducted of the Medline/PubMed database accompanied by a handsearch. Clinical human studies reporting on periimplant marginal bone level (BL) and/or changes in bone level (BLC) and with a follow-up period of at least 12 months were selected for the present review. Results: The search strategy resulted in 816 articles and 115 relevant publications were included for full-text analysis. Only few randomised controlled trials exist comparing immediate or early implant placement with placement in healed bone (the conventional protocol). Summarising the results from prospective studies, it was found that the mean marginal bone loss around immediately or early placed implants from baseline (at implant placement or placement of restoration) to the latest followup visit (between 1 and 10 years) was less than 1.5 mm. Conclusion: The current literature indicates that immediate or early placement of single-tooth implants after tooth extraction may be a viable treatment with long-term survival rates and marginal bone level conditions matching those for implants placed conventionally in healed bone ridges. Aim: To analyse data on bone augmentation at single-tooth implants with regard to the type of graft materials, the stability of grafts over time, reported time span towards implant placement, implant survival rates, implant marginal bone maintenance and possible complications. Material and methods: A literature review resulted in 585 titles after exclusion of duplicates. Analyses of article titles and abstracts reduced the number to 93 studies, which were subsequently full-text analysed. After the final selection, a total of 24 studies were included, of which 13 reported on single implants and horizontal/vertical augmentation (onlay), 10 focused on single implants and sinus augmentation (inlay), and one study presented the outcome of single implants and distraction osteogenesis. Results: All bone materials, i.e. autografts, allografts, xenografts, and alloplasts, were used with comparable satisfactory results, allowing for placement of 7 to 10 mm-long implants. Stability of bone graft volume over time was sparsely documented. Some onlay autografts tended to resorb early i.e. prior to implant placement, but minor bone resorption was also seen for other grafts over time. A continuous but small bone resorption of inlay autografts and alloplasts was seen over time for the few sites recorded. A staged approach predominated for the onlay grafts, with implants placed 3 to 6 months post-grafting, and overall a majority of these implants (347/363) were submerged. For the inlay graft procedures almost all implants were immediately inserted at the time of grafting, and the majority of these implants (253/256) were submerged. A total of five and two implant failures were registered during the various study periods for the onlays and inlays, respectively. Marginal bone conditions, around implants in grafted sites, were comparable to what has generally been reported for non-grafted sites. Conclusions: Bone augmentation for the single-tooth implant is a viable treatment option with predictable graft and implant outcomes. Pozzi, Alessandro / Polizzi, Giovanni / Moy, Peter K.
Aim: To systematically scrutinise the scientific literature to evaluate the accuracy of computer-guided implant placement for single missing teeth, as well as to analyse the eventual clinical advantages and treatment outcomes. Material and methods: The electronic and manual literature search of clinical studies published from January 2002 up to November 2015 was carried out using specified indexing terms. Outcomes were accuracy; implant and prosthetic failures; biological and mechanical complications; marginal bone loss (MBL); sulcus bleeding index (SBI); plaque score (PS); pink esthetic score [PES]; aesthetic and clinical outcomes. Results: The search yielded 1027 relevant titles and abstracts, found during the electronic (n = 1020) and manual (n = 7) searches. After data extraction, and screening of titles, abstracts, and full-texts, 32 studies fulfilled inclusion criteria and were included in the critical review: two randomised controlled clinical trials, six prospective observational single cohort studies, one retrospective observational study, three in vitro comparative studies, 10 case reports and 10 systematic reviews. A total of 209 patients (18 to 67 years old) were treated with 342 implants using computer-guided implant surgery. The follow-up ranged from 12 to 52 months. The cumulative survival rate ranged from 96.5% to 100%. Eleven implant planning softwares and guided surgery systems were used and evaluated. Conclusions: Computer-guided surgery for single missing teeth provides comprehensive treatment planning, reliable implant positioning, favourable clinical outcomes and aesthetics. A tooth-supported template for the treatment of single missing teeth results in greater accuracy of implant positioning than with mucosa-supported or bone-supported templates. The limited scientific evidence available suggests that guided surgery leads to implant survival rates as good as conventional freehand protocols. Computer-guided surgery implies additional costs, that should be analysed in terms of cost-effectiveness, considering the reduction of surgery time, postoperative pain and swelling, as well as, the potential increased accuracy. Long-term randomised clinical trials are eagerly needed to investigate the clinical performance of guided surgery in partially edentate patients. Background: Placement of single implants is one of the most common applications for implant treatment. Millions of patients have been treated worldwide with osseointegrated implants and many of these patients are treated at a young age with a long expected remaining lifetime. Therefore longterm evidence for such treatment is important. Aim: To report patient treatment, implant and implant-supported single crown survival over at least a 10-year period of follow-up. Material and methods: After reviewing long-term publications, included by Jung et al (2012), a complementary PubMed search was performed using the same search strategy for the period September 2011 to November 2014. Data on implant and single implant crown treatment survival were compiled from included studies. Results: Four new publications were identified from the 731 new titles. They were added to an earlier list of five manuscripts by Jung et al (2012) , which were already included. Accordingly, nine publications formed the database of available long-term evaluations. The database consisted of 421 patients altogether, provided with 527 implants and 522 single crowns. From the 367 patients that were followed-up for at least 10 years (87%), altogether 502 implants were still in function at the completion of the studies (95.3%), supporting 432 original and 33 remade single implant crowns. Based on patient level and implant level data, implant survival reached 93.8% and 95.0%, respectively. The corresponding survival rate for original crown restorations was 89.5%. Conclusions: Single implant treatment is a predicable treatment over a 10-year period of time, with no indication of obvious changes in implant failure rate between 5 and 10 years. However, replacement of new single crowns must be considered during the follow-up as part of regular maintenance. Compared to the number of treated patients worldwide, the available numbers with a follow-up of 10 years was low. 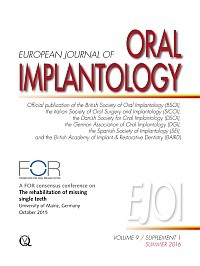 Foundation for Oral Rehabilitation (FOR) consensus text on "The Rehabilitation of Missing Single Teeth"